SAY HELLO TO KNIGHT! 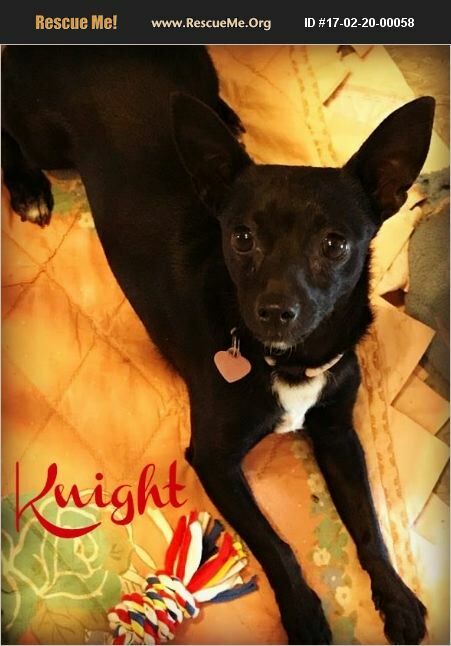 Knight is a stunning jet-black Miniature Pinscher/Chihuahua mix boy. Knight was found abandoned in a private dog park. He was with another Chihuahua who was picked up by a bystander and his location is unknown. This rescue searched for his owner just in case he was a missing dog, however his owners have never been found. Knight is simply the sweetest boy and loves to play. Just so so very happy! He enjoys his housemates at the foster. He walks well on a leash and is housetrained, however as all rescues do, will need gentle guidance in his new forever home. Knight will do very well with adults and adults who have older kids who are respectful of his size. Knight has an easy to care for coat and should be bathed as needed and regular nail trims every 6 to 8 weeks. Knight's adoption fee is $85.00. This fee includes his neuter, vaccinations including rabies and bordatella, de-worming, micro-chip with free lifetime registration and professional groom.